Paying for your home improvement project does not have to be a hassle. We offer several options for paying off your project upon completion. 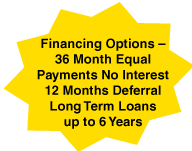 We offer loan terms up to six years in length and there up to 36 months of equal payments with no interest.